Stops gingival bleeding and seepage that may interfere with impression taking. 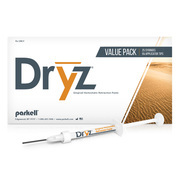 Great for tissue management when seating restorations, placing rubber dam clamps (controlling bleeding), bleaching teeth (to manage moisture) and restoring sub gingival cavities. Fast-acting Fraction of the cost of all other retraction materials. Light green color makes the material easy to detect. Also available in Unit Dose Capsules.